As a photographer it is all too easy to get immersed in the business of actually taking photos, and forget about the little ‘housekeeping’ tasks that need to be done in order to keep your kit running properly. It is a sad fact, however, that if you ignore these annoying little tasks, your images will start to show their flaws. Quite often, when you are looking closely at an image in Photoshop, you may see what look like little specs of dust around your image. Your lens may well be clean (or as clean as you can get it), but the specs still won’t go away. In this instance some people panic and assume that they have ‘dead’ photosites on their camera sensor; that is, they think that certain tiny elements of the sensor are not working properly. However, this is almost certainly not the answer. A far more likely explanation is simply that the sensor itself needs a clean. 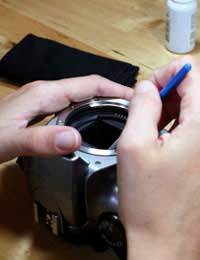 If you own a Nikon camera, you are likely to have been put off by their terrifying warranty warnings, strongly suggesting that you should not clean the sensor yourself. However, almost every other camera manufacturer states that user cleaning is fine, with the proviso that you use the right equipment. This can be a fiddly task, but as long as you have the right tools and you are sensible, there is little reason why you should cause your camera any damage. It is impractical to send the unit back to the manufacturer every time you get some dust on the sensor, and besides, it is a pretty sturdy piece of hardware; in terms of hardness it is about half-way between talcum powder and diamond. There are a few professionally manufactured sensor cleaning kits available now, although these are a relatively new arrival to the market. I would recommend picking one of these up if you can afford them (you might well pay £40), if only because if you do cause lasting damage, you may well have less trouble with your warranty if you can show that you used proper kit. These kits come in two main varieties; one is a brush-type contraption which has splayed bristles to allow you to get a good purchase on the sensor. The other type is a bit like a cotton-bud, and is used for cleaning smaller areas. Generally, the brush should be used first and for general cleaning. This should be sufficient for getting off the general dust that might have collected on your sensor; remember to clean in a circular motion and not to rub across the sensor as this can achieve no more than simply moving the dust, or, at worst, scratching the sensor. If you have particularly stubborn dust particles, you should wet a swab in a substance like methanol. If this leaves streak-marks on the sensor, use another swab to remove them. It should be noted that sensor cleaning is a fiddly job, and one which can be expensive if executed badly. As a result, please note that this article in no way encourages you to do anything that your manufacturer advises against; everything you do is at your own risk!